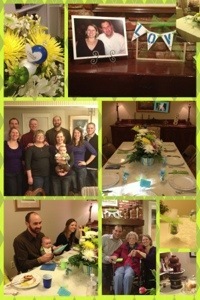 Brian’s aunt and uncle hosted a lovely, fun engagement party for us. We were able to introduce several of our family and relatives for the first time and everyone seemed to have a terrific time! This is the end of of 31 Days with the Nester and 1238 other bloggers. I plan to resume weekly posts like Lows & Highs and Insta-Friday. I also plan to add a weekly random question post. Other posts will continue to be as I feel inspired and find time to write. 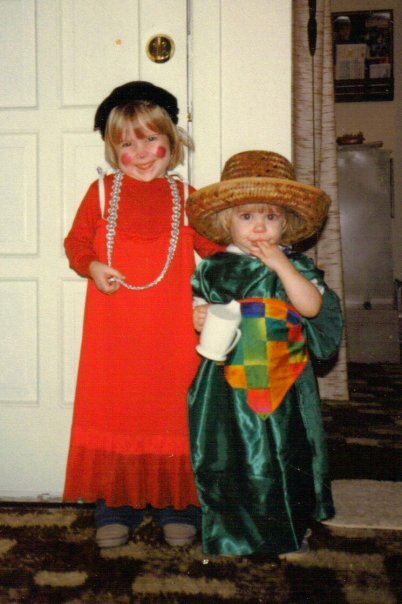 Did you dress up for Halloween as a kid? Do you dress up for Halloween now? My siblings and I did dress up for Halloween, but I remember thinking, “So we dress up in costumes, go to see the neighbors and they give us candy… How is this different from most days?” We liked dressing up so much that we had a collection of costume clothes that we wore on wild, imaginative adventures in the backyard. I had not dressed up for Halloween in years, but was invited to a costume party this year. 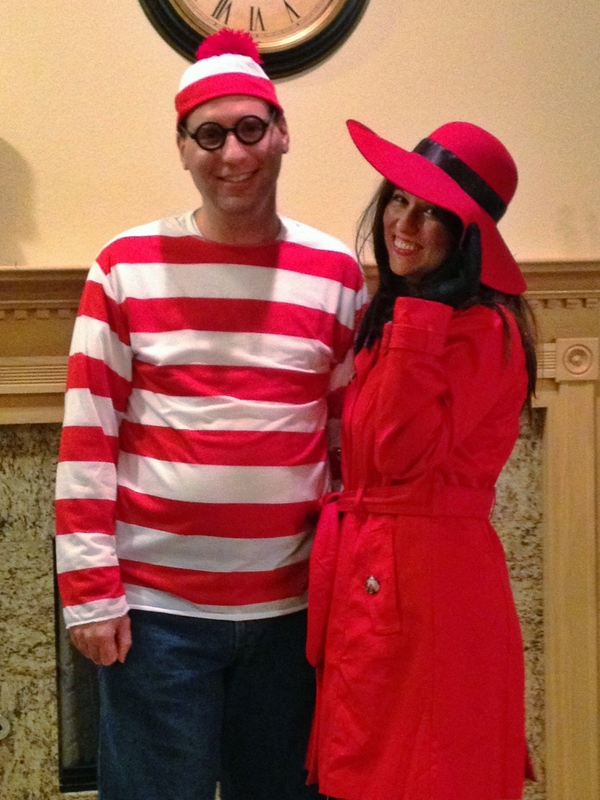 Brian was Waldo and I went as Carmen Sandiego. * I have short, blonde hair, so many people did not recognize me at first (in person and in photos). It was easily the most fun costume I have had as an adult! *Carmen and Waldo, hard-to-find globetrotters who wear red, are much more popular couple costumes than I first realized. How did you get your name? What does it mean? My parents told me they gave me the only name they agreed on at the time: Abby. Not Abigail, just Abby, because Dad thought Abigail sounded prissy and he did not want a prissy daughter. It did not really help, but he did try and I was eventually nurtured out of the prissiness. I get amused when people occasionally call me Abigail. It does not bother me – I view it as a nickname. If they ask, though, I smile and tell them I’m Abby, not Abigail, but they can call me either one. Abby comes from Abigail which means “my father is joy” or “my father’s joy,” depending on how you translate the original Hebrew. I really thought I had today’s post all written and scheduled to post at 6:00 a.m… It has been a busy weekend with meeting my nephew for the first time, partying at a wedding (where I saw no bouquet throwing! ), taking a four-hour road trip, and catching up with two different friends. I have had a marvelous time! Bonus question: How was your weekend? Actual question I intended for Day 28: What is one smell that brings back a childhood memory? The smell of coconut reminds me of sunscreen and summer and swimming at the lake or pool. As far as I remember, all sunscreen smelled like coconut in the 80’s and early 90’s. To this day, that olfactory trigger is why I avoid coconut-flavored drinks. They taste the way sunscreen smelled. Do you have any random, weird, or obscure talents? My tangible collections are journals I have filled (dating back to the early 90’s), children’s and young adult books I enjoyed as a kid, and interesting glass bottles. My intangible collection is hundreds of stories, real and invented, mine and others’. I remember the plots and characters and can retell them or listen to them over and over. I have loved stories for as long as I can remember. We are nearing the end of the 31 Days Challenge, so make any question suggestions and I will do my best to answer them before the end of the month. What has fear of failure stopped you from doing? Skydiving, singing solo in public (singing is definitely not my gift! ), diving from a high board, flying with a jet pack or in an ultra-light, bungee jumping, stopping a speeding train like a superhero. I have no interest in trying any of these things, though! What was a low point from your past week? What was a high point? Low: Fall allergies are giving me headaches and congestion, which can make it hard to be alert and focused. Only a few hours old! High: I am an aunt! 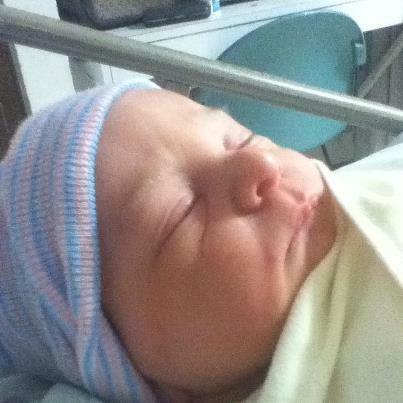 My nephew, Eli, was born on October 18 and looks adorable in the photos! I get to meet him on Saturday. He and my sister are both fine and went home the next day. Question asker’s note: You can change “past week” to “today” or the weekend when asking family or someone else you talk to all the time. I have dear friends who share lows and highs over dinner with their three kids and anyone who happens to be visiting. Who or what do you avoid on a daily basis? I constantly avoid needless conflict… and I think most of it is needless. When I think something matters more than the discomfort and disharmony of conflict, I try to work it out as quickly as possible and then move on. If you could not have cake of any kind for your birthday, what dessert would you choose instead? I would pick my mom’s homemade cinnamon rolls with pecans inside and cream cheese filling on top. I love pastries, cinnamon, and cream cheese, so cinnamon rolls would be perfect if I couldn’t have my usual cinnamon swirl cheesecake.